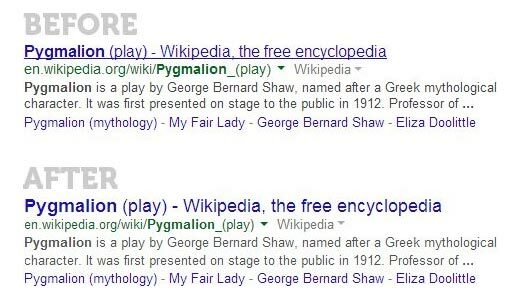 Google on March 13th 2014 made a few changes to the appearance of their search result pages (SERPs). One of the most talked about changes was their decision to drop underlined links, but one of the biggest impact changes from an SEO perspective is the reduced space available for page titles. The page title is one of the most important parts of the snippet that Google (and other search engines) display in their search results. The copy used in the title is what most likely will convince the searcher to click on your web page. It’s your click-through copy. We’ve seen the space available for the title shrink over the years in Google. Back in the day, Google used to clip the title if it was longer than 70 characters (meaning only 66 characters were displayed plus three dots if you had a title longer than 70). Back then there was no debate, there was a definite maximum. In 2012 Google dumped counting characters and starting using pixels instead. They display as much of the title as they can fit into a certain number of pixels. Research has shown that, until now, the pixel space available was somewhere around 512 pixels. This shrank to around 500 pixels when the ellipsis marks were shown, indicating the title had been truncated. This was valid when Google used 16px Arial for their page titles in search results. You ended up at a guideline figure of 65 characters as the optimal length. Sure, it was possible to have well over 100 characters displayed if you happened to have lots of “thin” letters in your title, just as it was possible to have a lot less with “fat” letters. This change (especially the increase in font size) has reduced the space available. an 18px font size is 12.5% wider than old 16px. If we take the old guideline figure of 65 characters, then this increase in font size means we’ve lost space for 8 characters, perhaps even 9 if the reduced pixel space is taken into account. 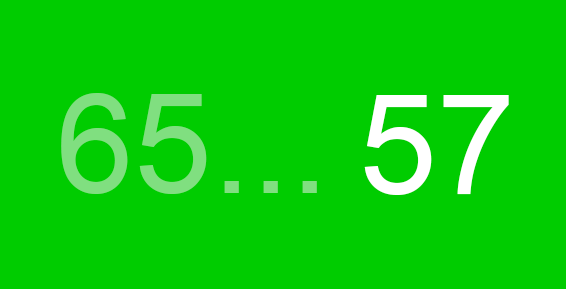 This gives us a new guideline figure for optimal page title length of 57 characters. Make sure you revisit your page titles and make sure that they are optimised for the shorter length of around 57 characters including spaces. Remember that Google indexes your entire page title and makes use of its contents in their ranking algorithms, even if they don’t display it all in the search results. Remember too that your page title isn’t only about helping your ranking in search engines, it’s also what your (potential) visitors see when staring at the search results and is critical in convincing them click through to your page. Moz have written an article about title lengths with some pretty good maths included and a tool for testing your titles. Their recommendation is 55 characters (but the peak of the standard distribution of their data corresponds to my 57). James Royal-Lawson+ is a freelance optimiser and consultant web manager based in Stockholm Sweden.